Look, here's the thing. 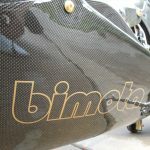 If you're buying bikes [or cars, for that matter] that were hyped to be "instant classics" when they were introduced, thinking you can flip them for a profit... You may be waiting a while. 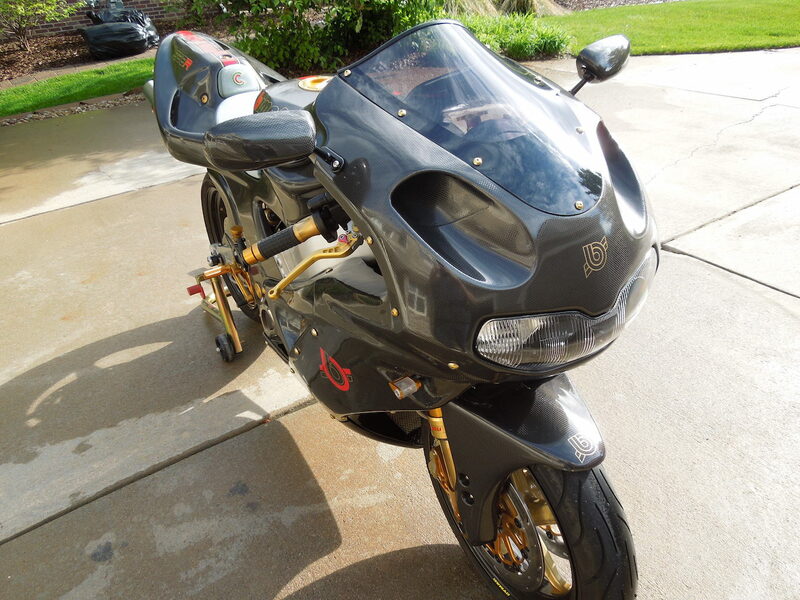 Consider all the folks who bought the MV Agusta F4 750 Serie Oro when it was new, hoping it would be a valuable investment. That was almost twenty years ago and those are still selling at a significant discount, especially when you factor in inflation... 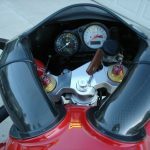 So if you're trying to buy low and sell high, you need to to look around the fringes, find the slightly forgotten and overlooked bikes. Maybe bikes that got universally blah reviews and didn't sell all that well when new, but have strong performance, distinctive character and, if possible, a face only a mother could love. 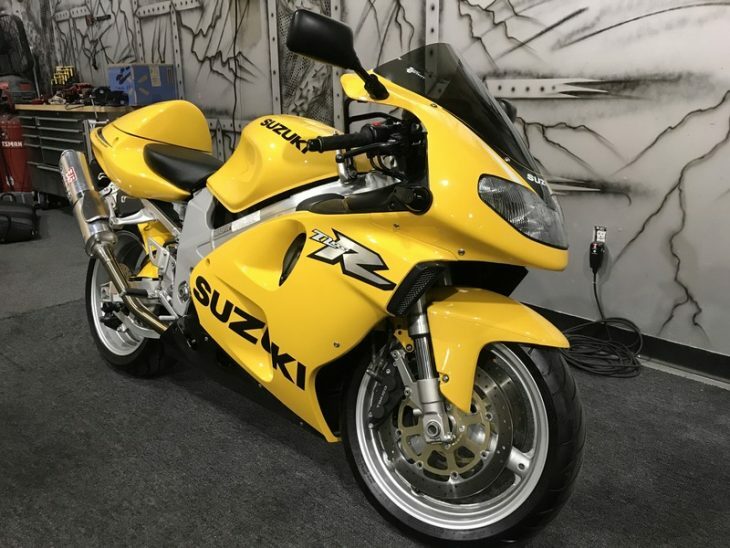 Something like this very low-mileage, banana-yellow Suzuki TL1000R. 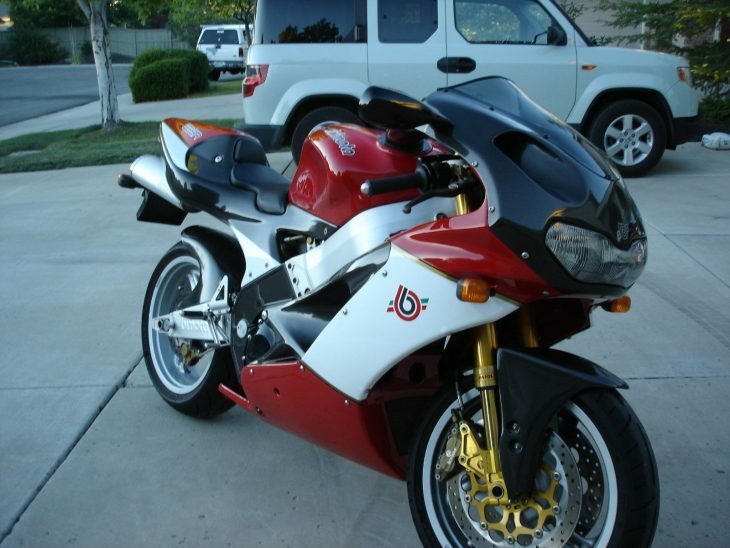 When introduced, pretty much every review I read of the TL1000R was damning with faint praise. 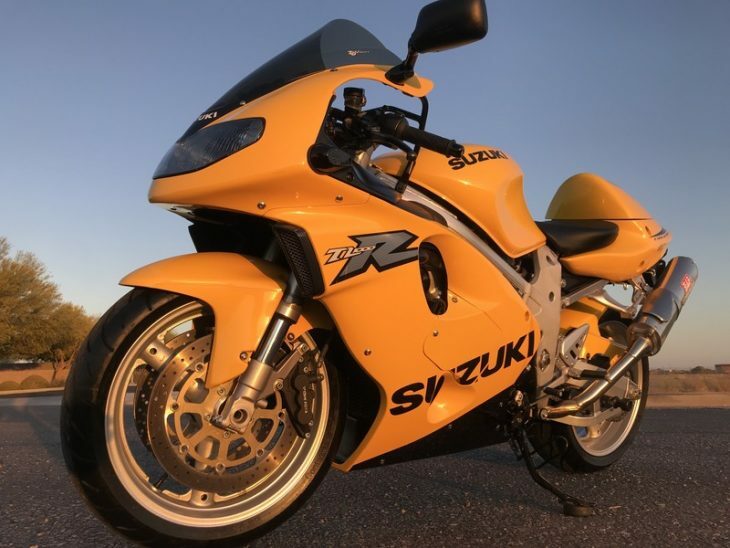 Billed as a "Ducati killer" it was too heavy, handling from the still-rotary-damped-dammit-Suzuki-stop-being-stubborn suspension wasn't as good as the 996, and styling was... odd. Sort of like the designers looked to the animal kingdom for styling inspiration, and found... the platyus. 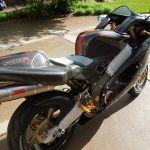 Still, the 996cc motor was a excellent, and made plenty of power with the fat midrange for which v-twins are justifiably famous. See, when they're new, bikes get reviewed in context. 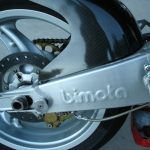 But decades later, they get to stand on their own merits, without being compared unfairly to the bikes they were supposed to outperform. 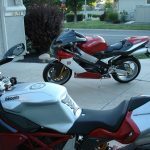 I'm joking a bit, but it's true: reading some magazine comparison tests, you get a sense that "if you ain't first, you're last" and I think many very competent sportbikes have been unfairly overlooked because they made a couple horsepower less than the class leaders, had questionable styling, or had handling that tried to kill their riders. 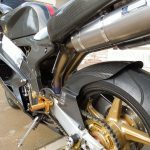 The TL1000R looks oddly bulbous, but it makes a great road bike, and a set of aftermarket cans like the Yoshimura bits seen here liberate some pretty great v-twin throb. 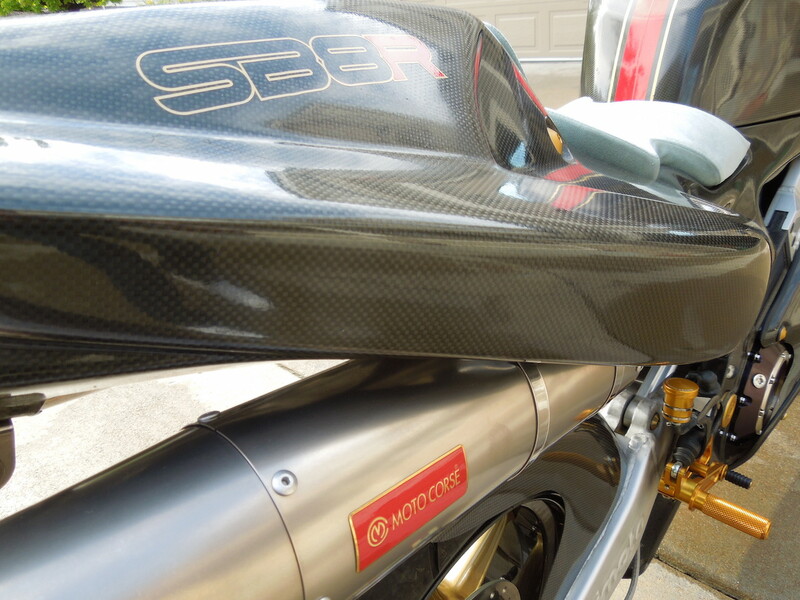 The 135hp won't see you winning any stoplight races against newer tackle, but if you can't have fun with that much power on road or track, maybe you should choose a different hobby. 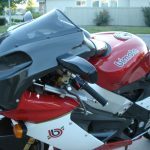 The package was high-performance enough for Bimota to use in their SB8R, and Performance Bikes did a series a while back, turning a nice TL-R into a literal Ducati-killer with a wild big-bore engine build, new gearbox, and lightweight bodywork. 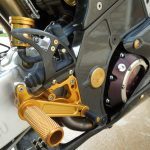 Significant upgrades to the power might be elusive or at least expensive for those of us without engine building friends or contacts with the gearbox specialists at Nova Racing, but fit some carbon panels and maybe a slimmer solo tail, change out the rotary damper at the rear for a more conventional unit, swap in a later GSX-R1000 front end for better forks and brakes, and you might be surprised at how much fun you can have on this affordable, reliable, easy-to-maintain v-twin sportbike. 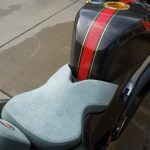 It's time to scoot your computer chair a little closer to the screen..... grab your reading glasses and prepare to view the cleanest Suzuki TL1000R on planet earth!! This is no exaggeration, view any of the provided photo's below and you will see what I mean. 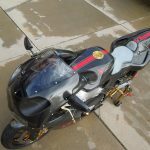 This bike was purchased brand new in 2003 by an elderly car / motorcycle collector and parked inside a carpeted and climate controlled garage it's entire life. This bike has NEVER seen a race track and has never been ridden past 8,000RPM's, ever. This is the most babied and well taken care of example you'll ever see, anywhere. Literally looks like it just rolled off the showroom floor - as the photo's clearly show. If you're a true motorcycle enthusiast, this particular bike will bend you at the knee's. With with only 2,583 ORIGINAL MILES, it's probably the lowest mileage TL left in existence too. Look anywhere you can think of...... 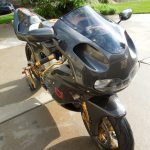 Cycle Trader, Craigslist, Ebay, Offer up, or anywhere else you can think of and you will see how rare these bikes truly are. Most of them have been highly modified, raced or stunted and abused. Primarily because they are so well built and tough - they can handle the abuse of people beating the hell out of them. As sad as that sounds, you will have nothing to worry about in that department with this bike. Look over all of the provided photo's in detail and you will see what I mean. This is the closest you will ever get to showroom perfect as they come. And SURELY the cleanest 2001 TL1000R on the market - anywhere. Hands down... Guaranteed!! You absolutely WILL N O T find a cleaner TL anywhere. 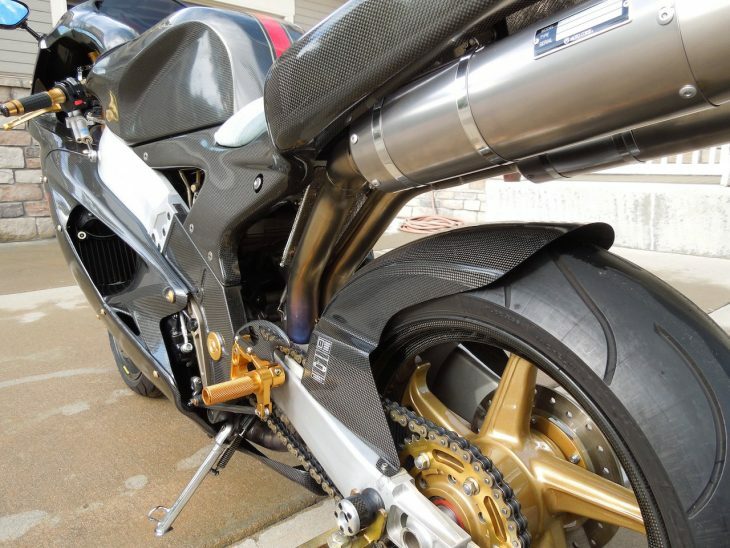 This bike is SO clean you could eat your steak dinner right off the engine. 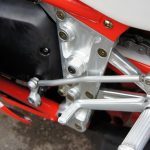 I have provided close up images showing the inner wheel hubs, the engine cases, coolant lines, chain, seats, trunk, dash, brake levers, shocks....... everything you would hope to see if you were buying a bike. Look closely at the images provided and you will see what I mean. Being garaged and covered it's entire life, there is no rust, no corrosion and no discoloration from road grime or road salt etc. 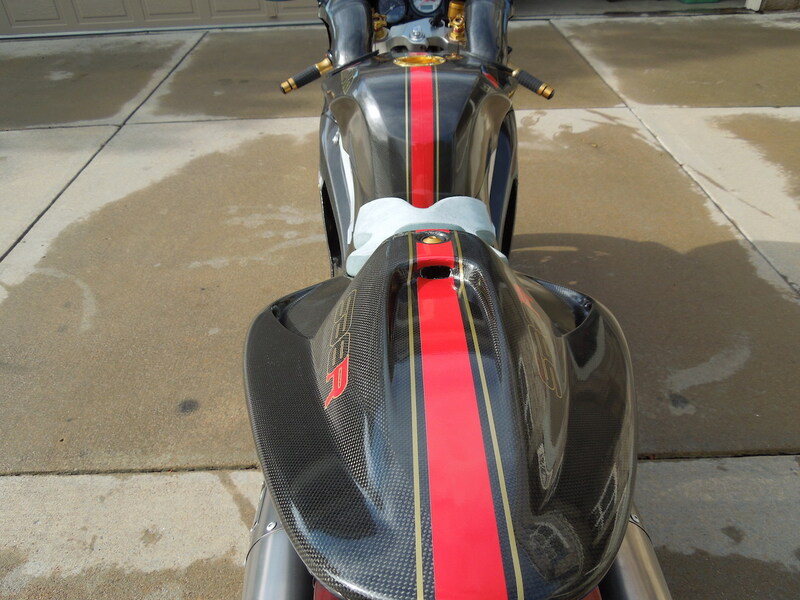 This bike looks just as clean underneath and inside the fairings as it does on the outside. The paint condition and quality is (literally) like new. 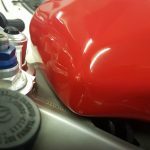 No pit marks or chips on the front end and no (dirty rag) swirls or marks on the body. As I said - this truly is the cleanest one you will ever find. 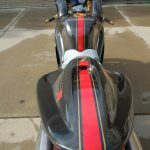 This bike is so clean it could be parked on the showroom floor at a Suzuki dealership on a display stand just to show it off. 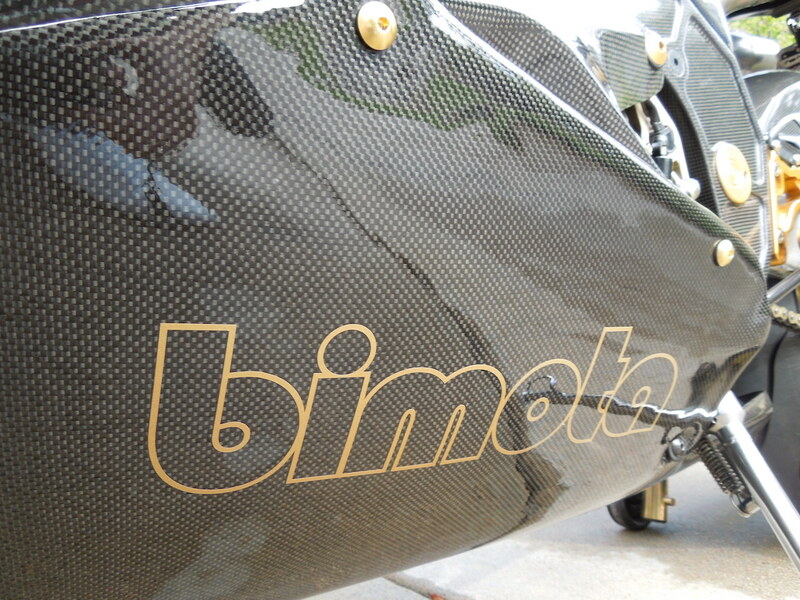 Unsuspecting customers would mistake it for a brand new bike....... it's THAT clean!! Being a collector bike, all stock parts were saved, packaged, boxed up and will go to the new owner. If the new owner would like to put everything back to OEM stock condition, the parts are here and can easily be re-installed. It comes with the original sales contract when it was purchased new, the original TL1000R owners manual and original TL1000R CD service discs. It comes with a matching yellow helmet, only worn twice. 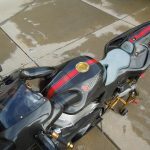 There's a custom motorcycle cover too that will go to the new owner. 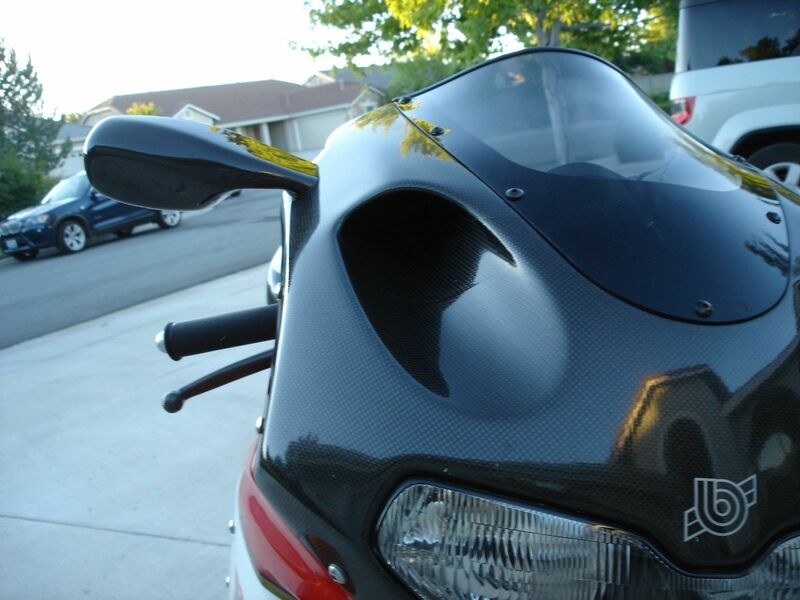 It fits the bike like a glove!! I even saved the original OEM tires that came on the bike when new. The tires were still in good condition, but I wanted to install brand new one's for safety. Not good to ride on old tires in my opinion, so I just had brand new tires installed front & rear. 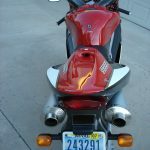 All of the extra's that come with the bike are shown below in the photo's. 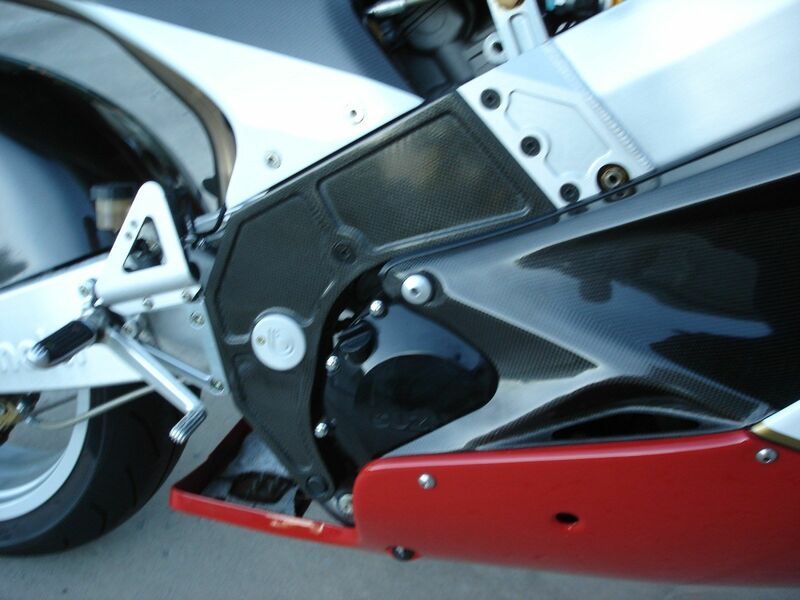 As with any pre-owned motorcycle or vehicle, normal signs of wear & tear may be present. 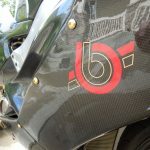 Scratches, nicks, chips, dings etc. 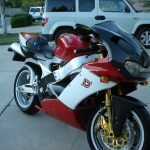 If you have any questions as to the condition of this bike, by all means - bring your mechanic and feel free to inspect it in person prior to bidding or purchase. 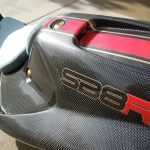 The only noted flaw I can find on this entire bike is on the left mid section of the fairing there is a small scratch in the chrome TL-R graphic. Not even sure how it happened, but it's about the only noted flaw I can find. 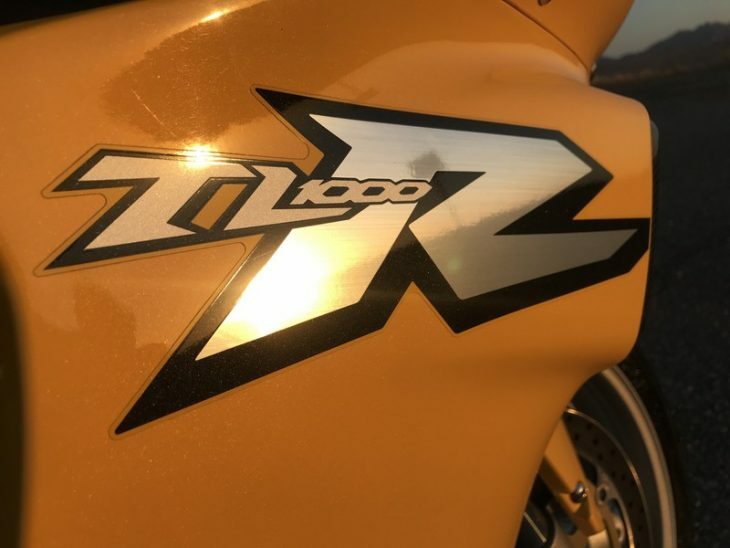 Replacing the TL1000R left side logo sticker would eliminate this completely. 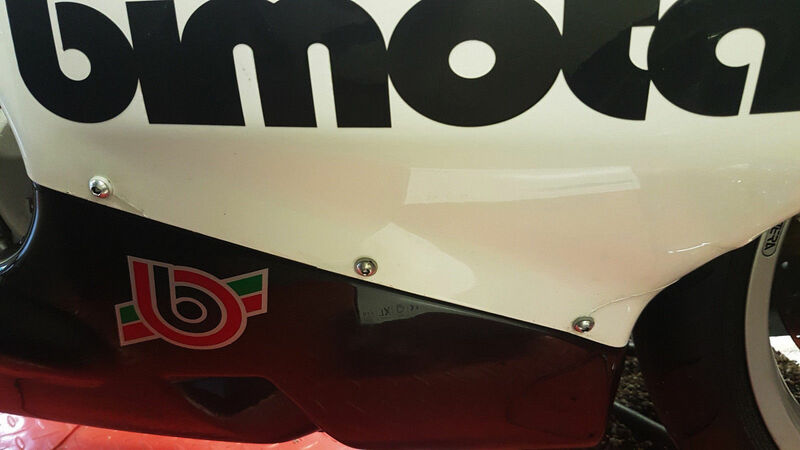 Also on the back edge of the left fairing just above the letter "K" where it says SUZUKI there is a small mark. 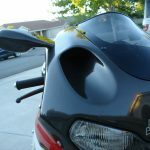 At one point in the bikes past, the fuel petcock sprung a tiny leak and some gas ran down this specific edge of the fairing which caused the smudge area. This can most likely be rubbed out or buffed back to yellow with ease. Also there is a tiny smudge on the back left outer edge of the Yoshimura slip on. Looks like it was done from shoe rubber. Will most likely rub off with a bit of effort. 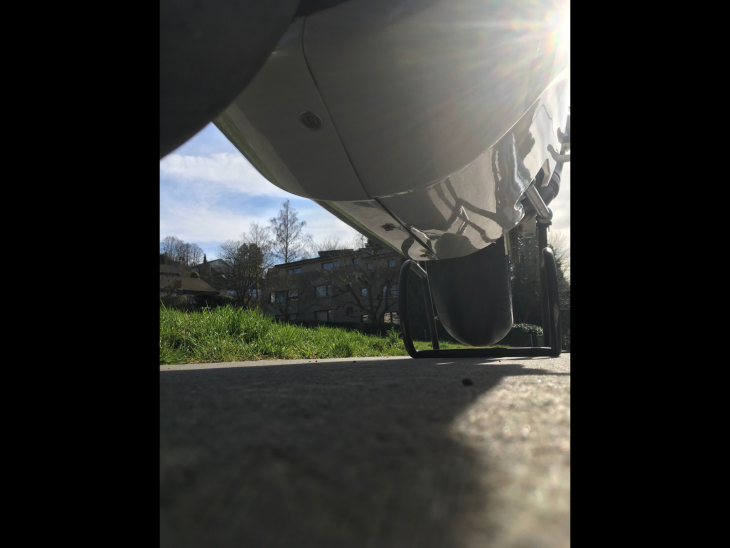 You would have to be sitting on the pavement looking eye level at the side of the bike to notice either of these imperfections. However, it is Ebay and I value my reputation as a seller so it's something I wanted to point out. 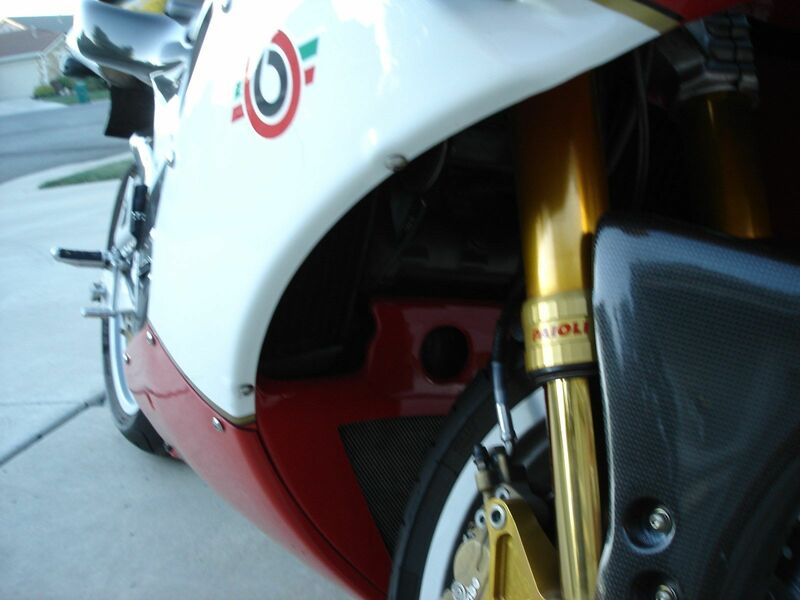 Aside from this, the bike is a close to mint as you will ever find. This bike looks like it has barely been ridden. Obviously, I'm not really suggesting the TL1000R is a great investment opportunity. But they're surprisingly affordable, offer great everyday performance, and really should increase in value over the next decade or so. 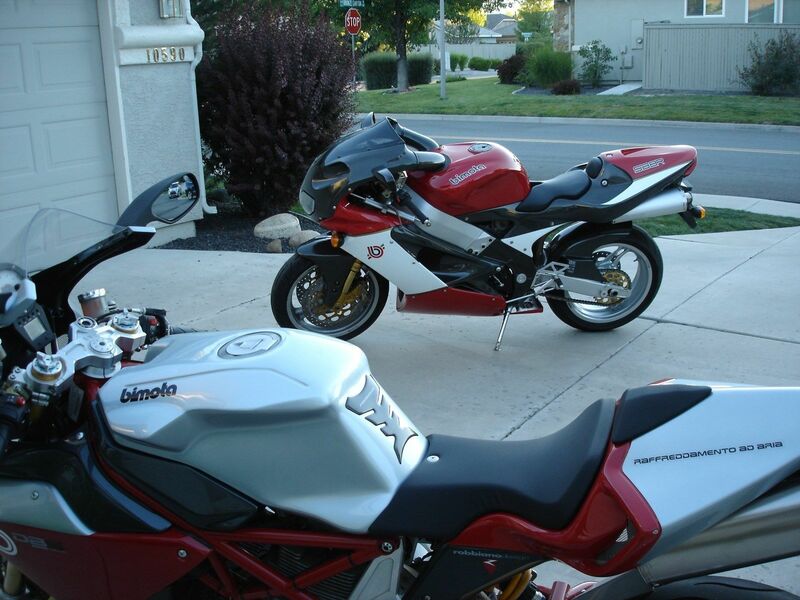 Maybe not as obvious: for all the cheap shots I've taken at the TL1000R, I like them. 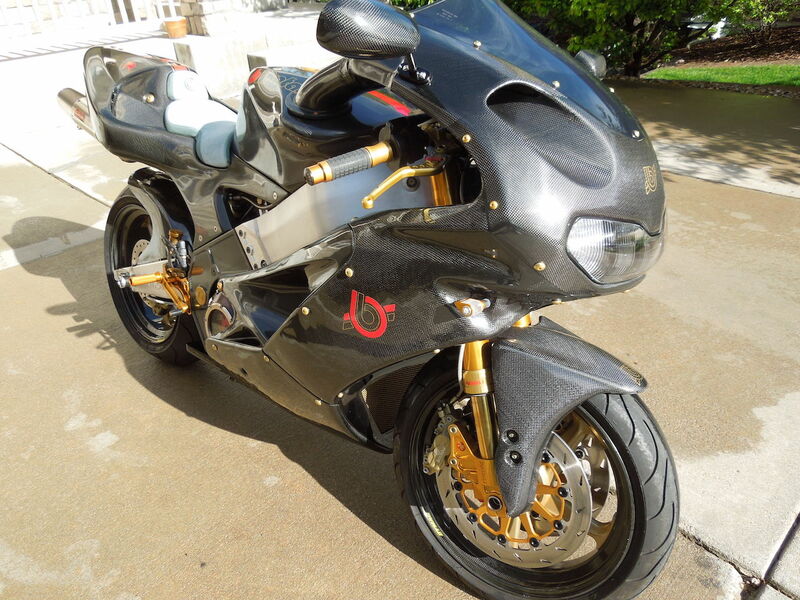 This example has seen just 2,600 miles so far, so you can actually do some riding on your duck-billed modern classic and still maybe make a few bucks when the time comes to sell it on to some sucker... err, collector, when values have really spiked down the road and you're ready to move on to the next forgotten superbike. 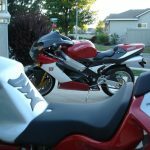 And before you scoff too loudly, or in print in the comments below, remember that nice, first-generation GSX-R750s have pretty much tripled in price over the past few years. 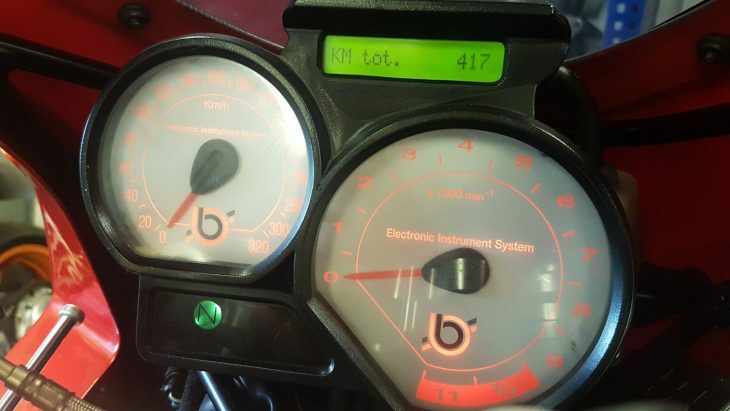 That may not be the reason you buy motorcycles, but it's nice to know you might at least break even on your weekend toy, after you factor in consumables and a bit of maintenance. The seller didn't set some wishful-thinking Buy It Now price either: bidding is very active and up to north of $4,000 as I write this. 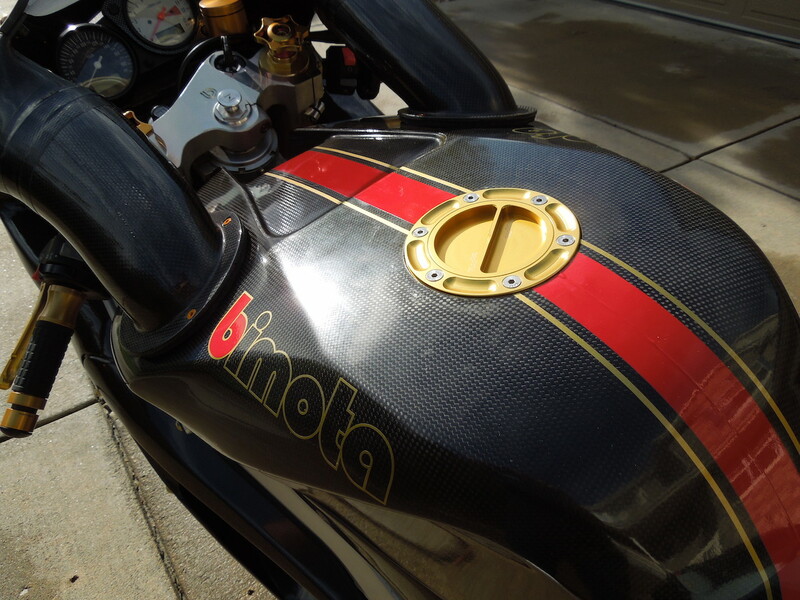 Here is a time capsule, a zero miles/NOS Bimota Tesi 1D SR that has never had fluids installed. 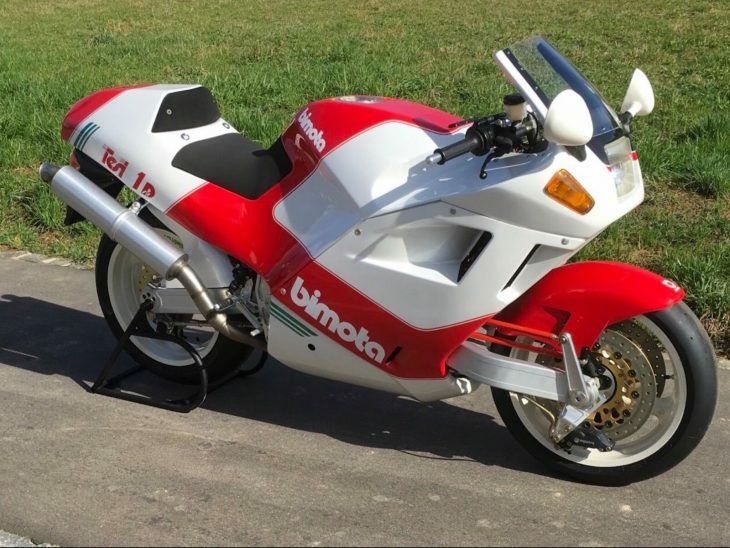 The 1st generation Bimota Tesi is already a bit of unobtanium and something every collector considers so this one is certainly one to take notice of...plus the color scheme is perfect for the holidays. 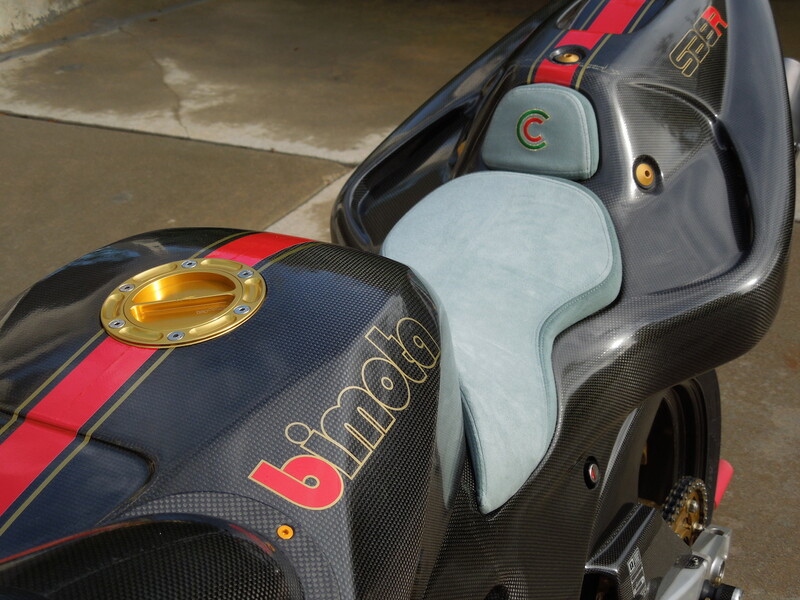 Thinking back on the late 1990's, it seems safe to say that the manufacturer that best embodied the period ethos of "throw-it-against-the-wall-and-see-what-sticks" was Bimota. Part of that was due to its small nature/lack of multi-layered governance and part of it was also probably due to it being an Italian firm where a certain level of fla.ir is expected. 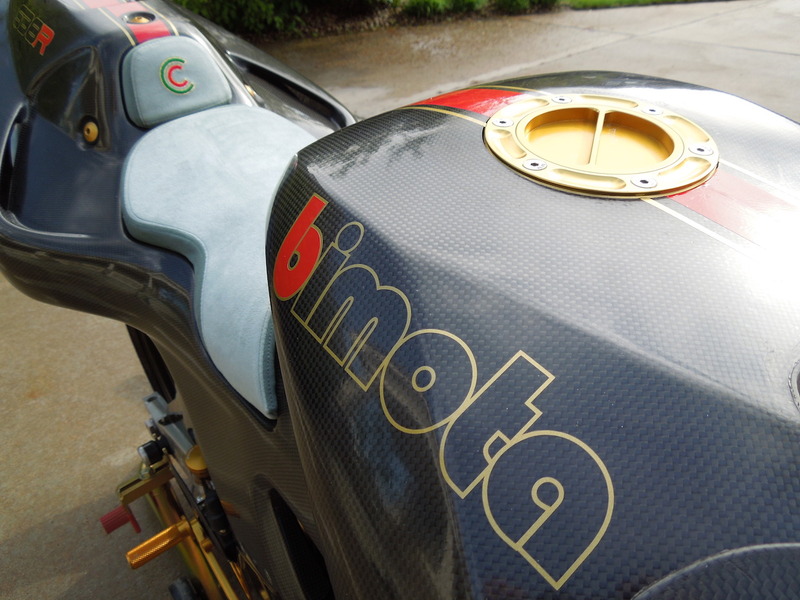 Regardless, Bimota was willing to bring unproven concepts all the way to market and while some of these never delivered as promised (cough-VDue-cough), the Tesi series actually did what it promised. 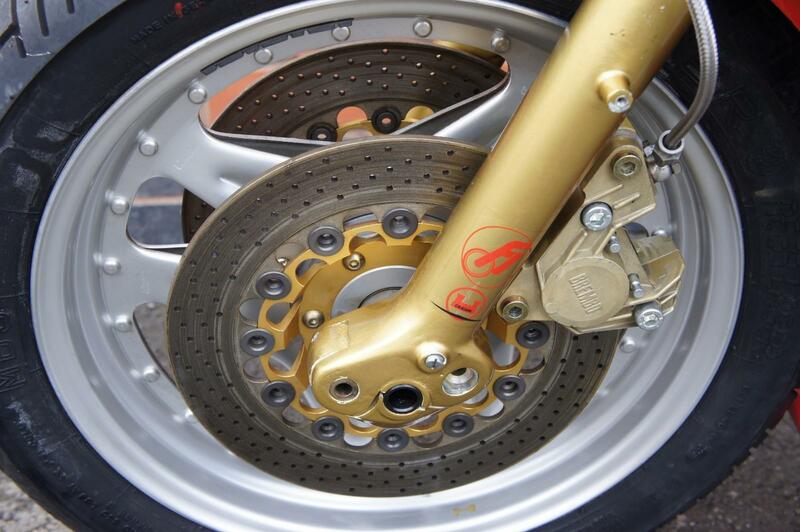 The Tesi promise was improved handling via a new suspension feature; hub-centered steering. 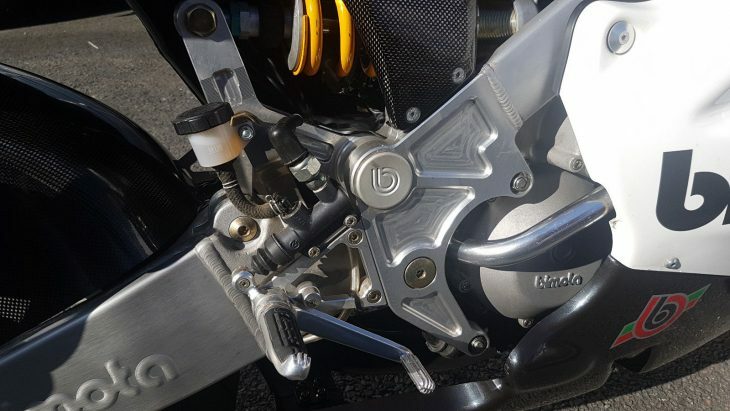 The Bimota hub centered suspension setup transferred braking force into the frame, not up into the headstock area like on a conventional bike. 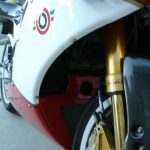 Without the impact of braking on the forks, the front end was significantly more stable which made handling feather quick and rock stable. 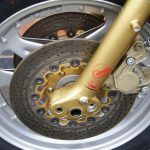 NOTE: A good write up about the concept of hub-centered steering and Tesi can be found here. 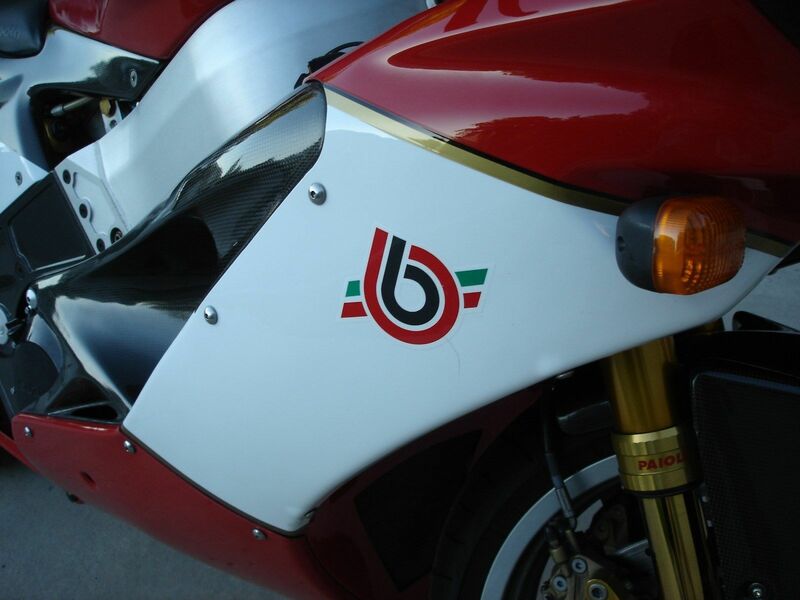 At the launch of the Tesi 1D Bimota said the plan was to build 300 but the actual production numbers are a bit vague. 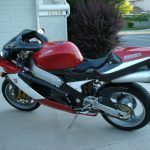 According to sources I found, over 400 were produced between its launch and end in 1994 and this number is said to have included about 50 produced with 400cc for Japan as well as some "Final Edition" and SR models which came with a 904cc 851 motor (the seller indicates this is one of the SR editions). 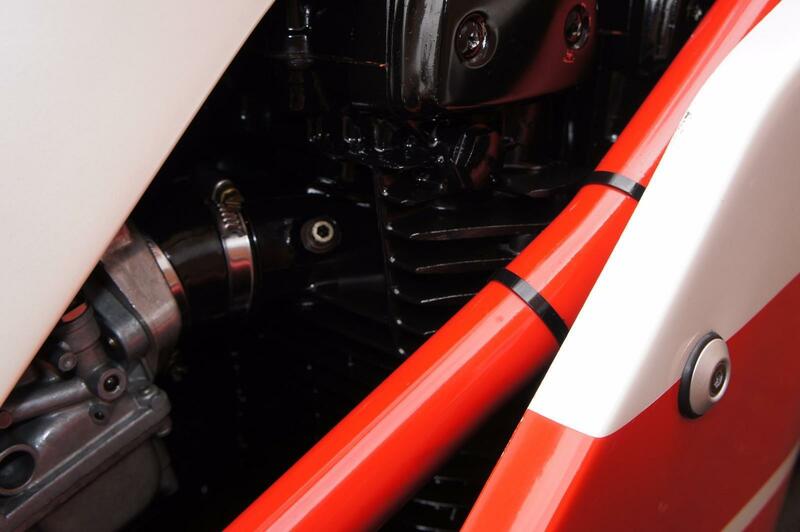 Mounted in Bimota's beautiful "Omega" frame the 904cc Ducati powerplant worked with the hub-center handling improvements to deliver a bike incredibly nimble for its size. 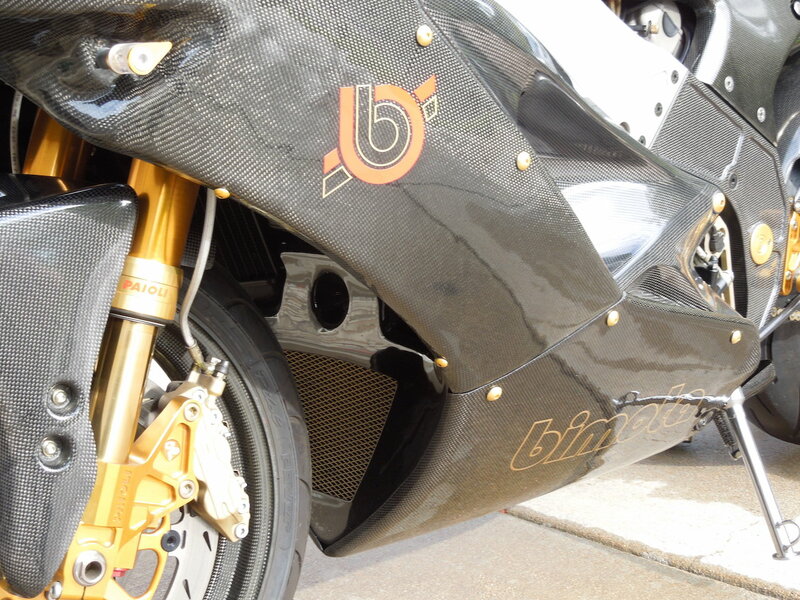 So why didn't the the Tesi and it's hub-centered design become the future of motorcycling? The main factor was probably price. 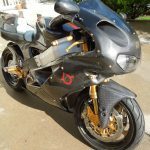 When introduced the Tesi was offered at the eye-popping price of $40,000 USD which made it the most expensive motorcycle on the market. 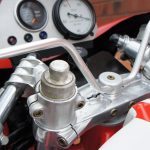 Also, the complexity of the bike scared away some owners, especially after reports surfaced that the futuristic electrics and digital dash board could suddenly shut down or give wrong readings. 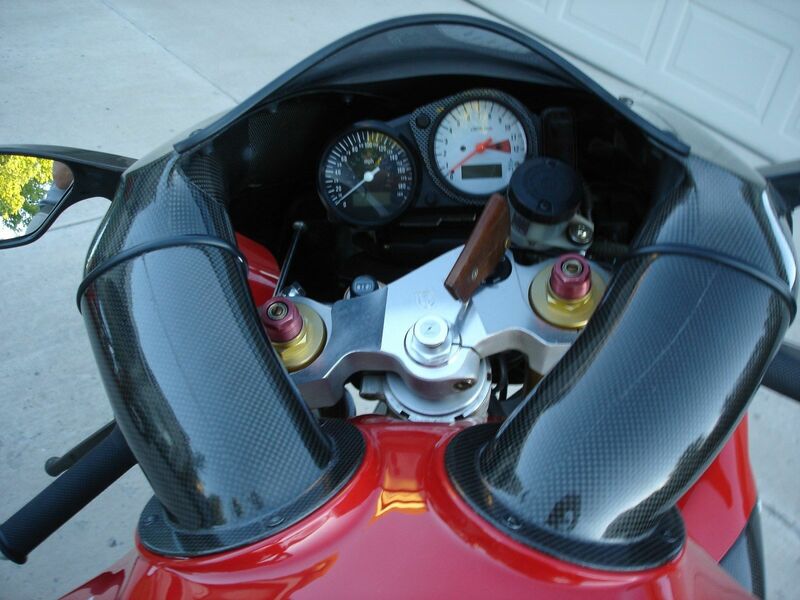 Never ridden, never run, properly prepared for long term display. Specifically ordered from the distributor without any fluids when new in 1992. 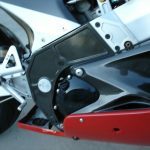 Neither the hydraulic brake system front and rear, nor the cooling system nor the original battery have ever been filled with fluids. 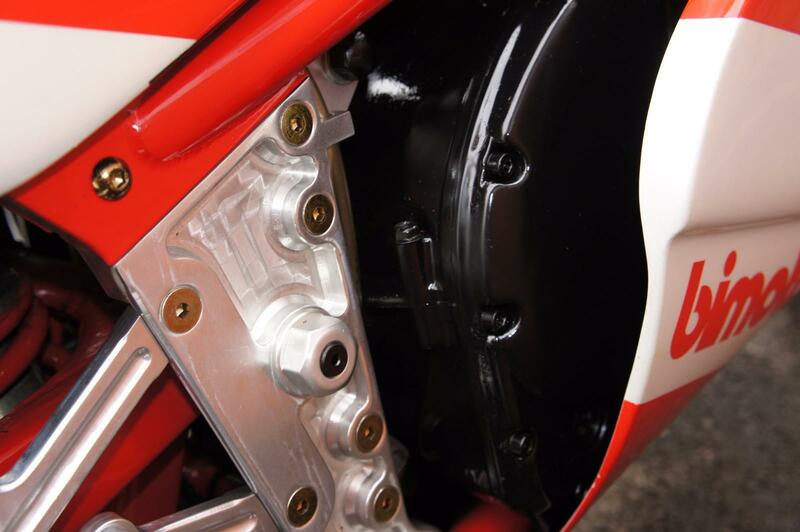 All mechanical components inside the engine are still coated with assembly lube from the Ducati factory. 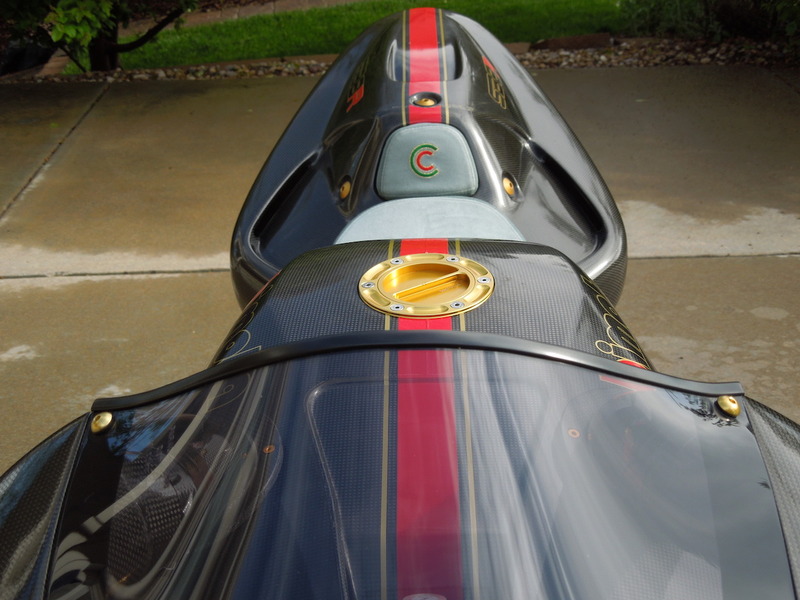 The engine is filled with a light-weight oil to preserve internals, it has never been started or run. 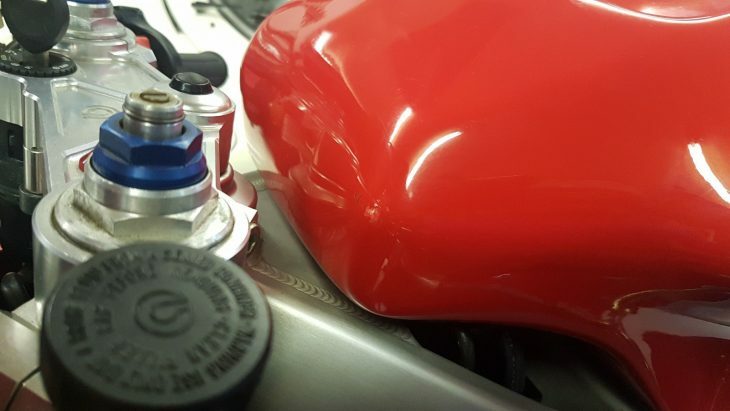 Kept in a climate controlled environment without UV light present, so there has been no deterioration of any rubber pieces and no discoloration of any painted or coated surfaces. 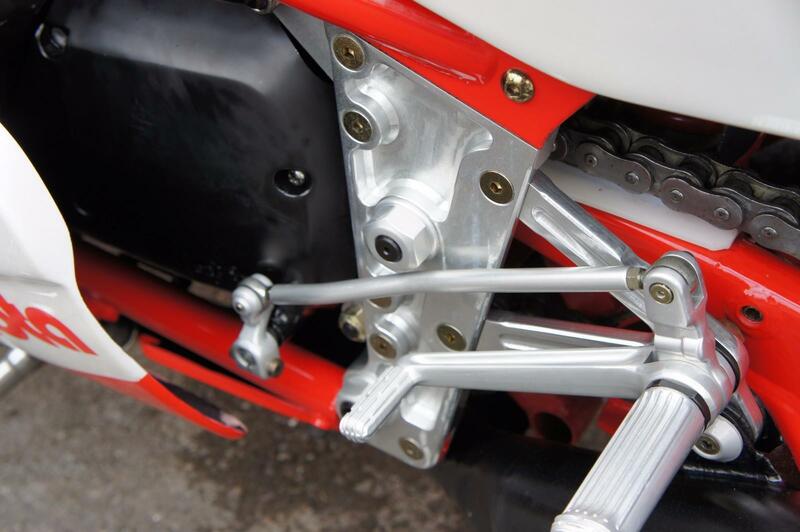 Of course there is no oxidation present on any metal surfaces or fasteners. 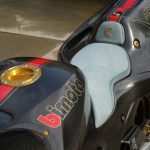 The protective yellow zinc plating on all three cast iron Brembo rotor surfaces is still present, the seat foam on the molded solo seat pad and backrest is still uncompressed. 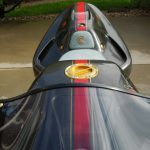 The tires mounted were specified to be racing tires when ordered new. 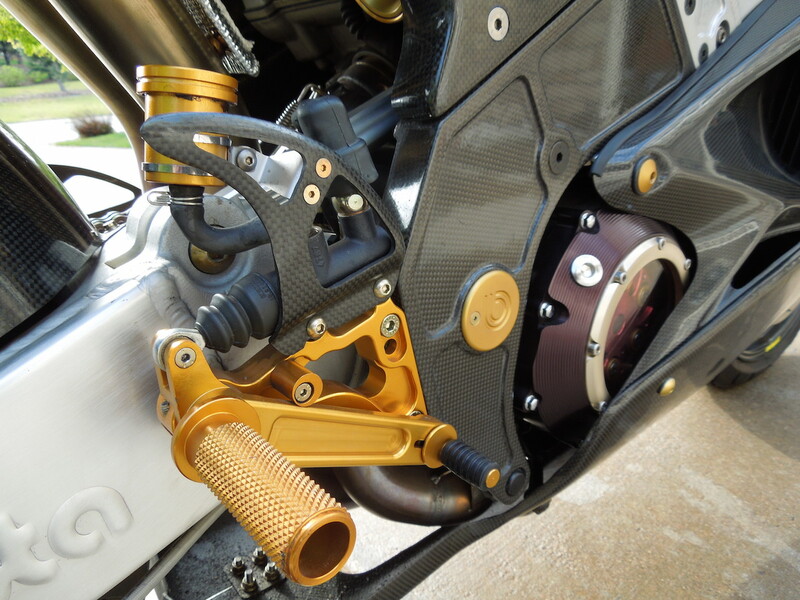 Levers, grips, pegs, chain, sprockets as most everything else on this motorcycle are as new as they were in 1992. 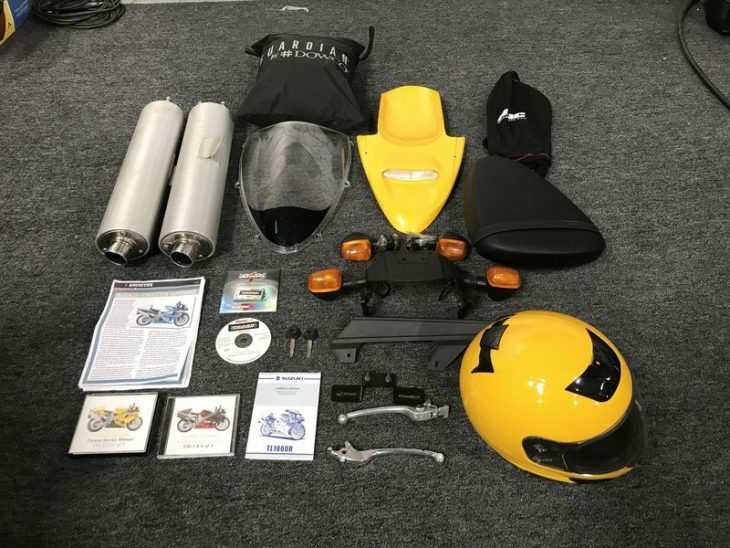 Comes with all the original ownership documents, customs forms, the owners manual, the warranty booklet, copies of the parts manual and workshop manual and the original Tesi toolkit in duplicate. 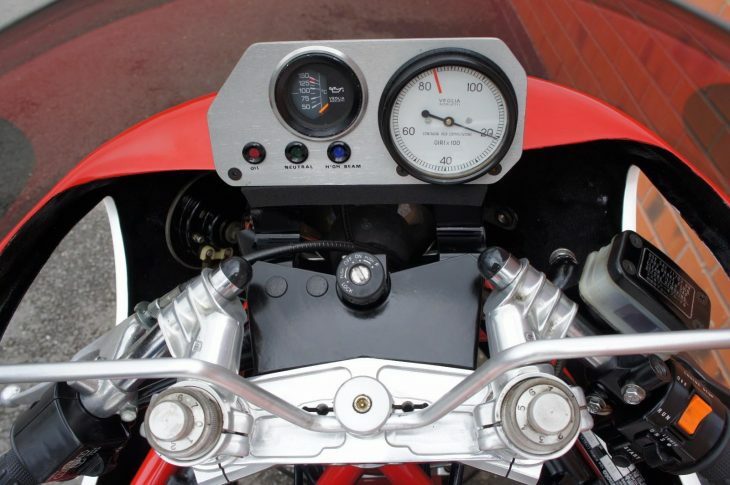 The original early Tesi rear stand, the one off custom front stand (for displaying the bike with both tires off the ground) both mph and km/h dash boards (km dash & computer packed up, mph dash with protective white film still underneath, mounted in the fairing) and two original Weber Marelli P7 ECU computers, one chip'd for regular street use and the other fully open P7 ECU chipped for race use performance, are also included. 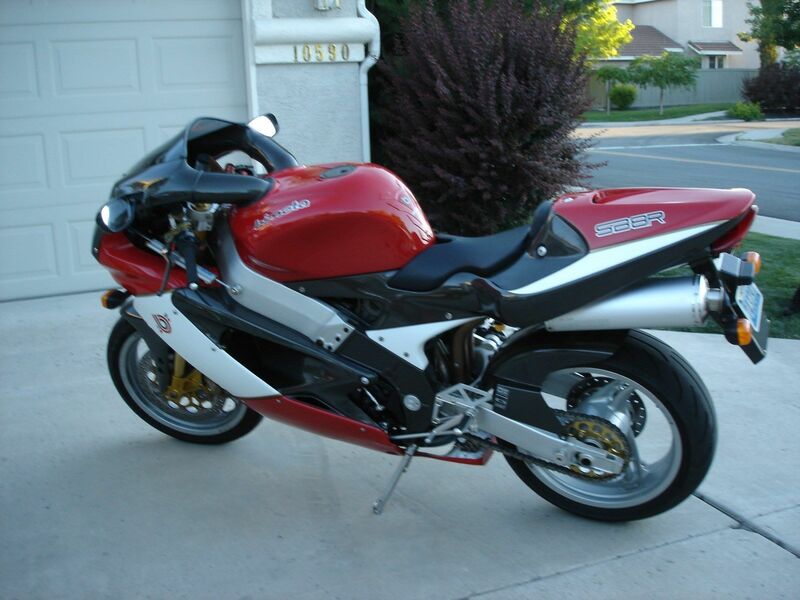 Multiple other original spares come with this bike. 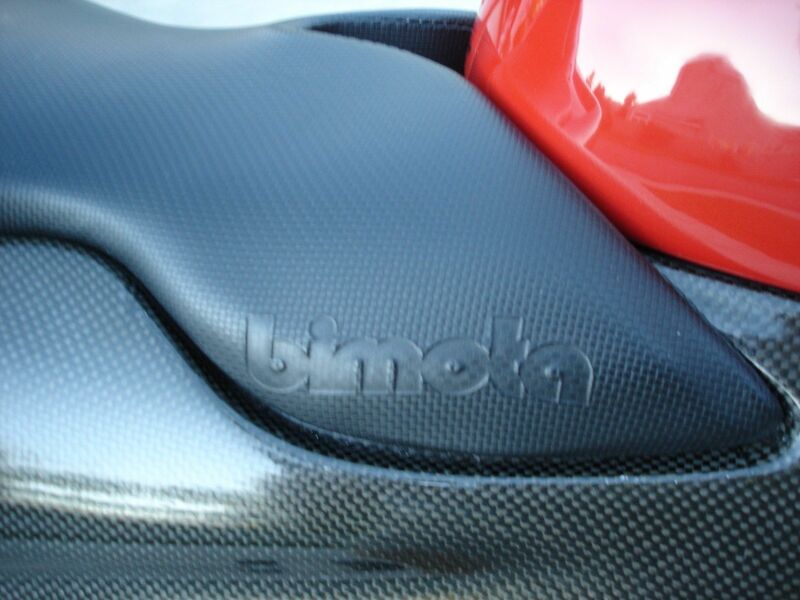 Of course the red Bimota cover is present and in its correct Bimota bag. Note: The seller also provides additional photos via an online photo album here. 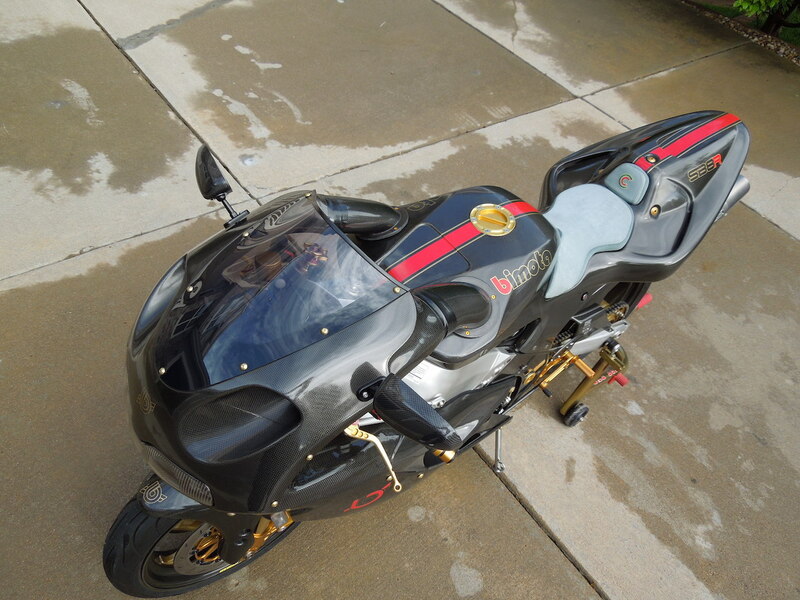 Now for the real question - is this bike worth the current asking price of $150,000 USD? Yes, you read that number right - $150,000 USD. That's almost 4 times the original asking price which is a level of increase I don't think we have ever seen on RSBFS before. 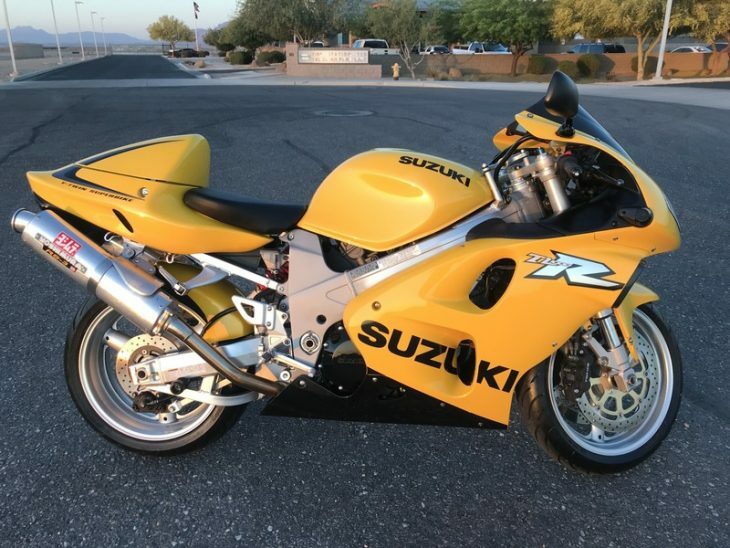 To be honest, when I saw that asking price I thought this was possibly a test listing by the seller but after communication with them, this is in fact the actual Buy-It-Now asking price. Since in most cases sellers expect offers with 10-15% of the BIN price, its seems safe to say this one is going to cost 6 figures US for any interested parties. So is a zero miles 1D SR Tesi worth that much? Personally I don't think so but the 1D and 2D series of the Tesi come up for sale so rarely I don't know what the current value is. I do think the current ask price means it won't go to an investment oriented collector but it could draw interest from the zero miles/"crate-bike" crowd. I guess we can only wait and see...but it would sure be a nice way to start the new year with it in your living room. 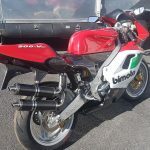 There were a lot of things that led to the Bimota V-Due's inauspicious fall from grace, mostly related to costs and hype that would ultimately spell disappointment when the bike finally broke cover. 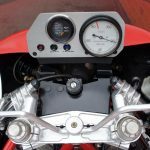 But by far the bike's worst flaw was its positively heinous fuel injection system, which was designed to keep the bike in compliance with emissions regulations while keeping a two-stroke's characteristic light weight and simplicity. 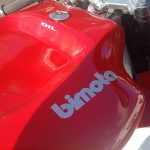 The fuel delivery system was so poor that many of the bikes were retrofitted with carburetors at Bimota's expense, which not only sank the company, it rendered the bikes offroad-only toys for the well-heeled, and not the stylish, fancy street racers the factory had envisioned. 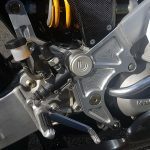 Added to the injection problems were oiling issues that seized pistons, electrical gremlins and poor crankcase sealing as the result of badly-cast engine cases. 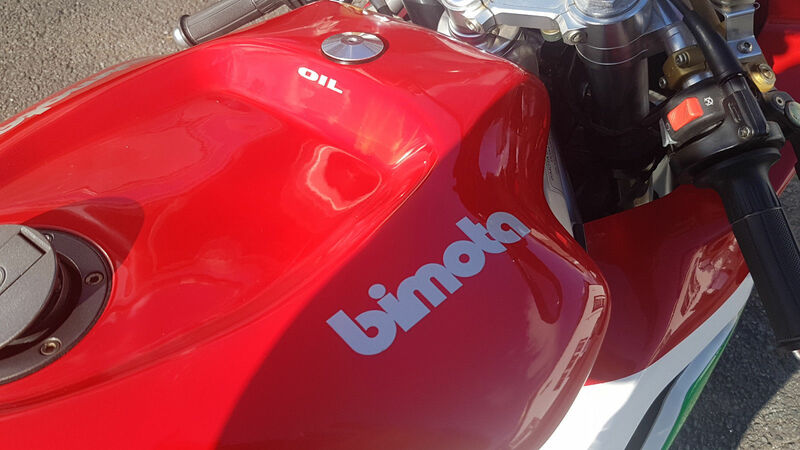 The 1998 Bimota V-Due shown here is one of the few that runs well, with both its fuel injection and street legality intact. 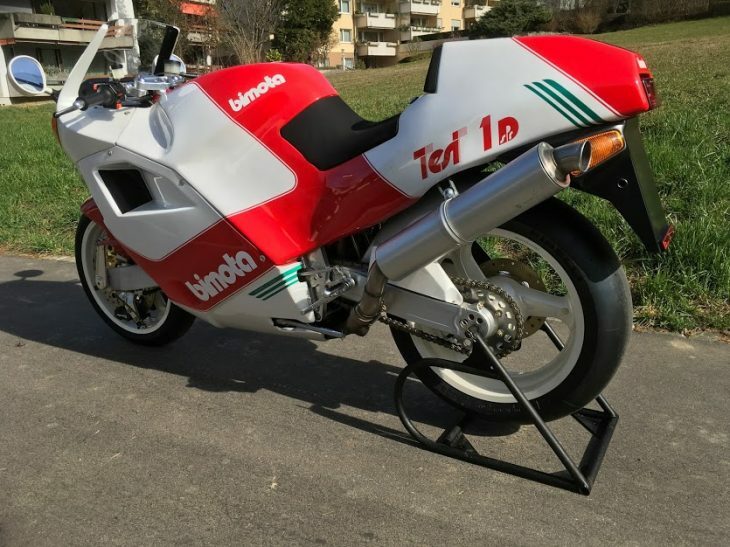 The seller says this bike was one of a handful that were purchased out of the company's unsold stock by Piero Caronni, who set about fixing the promising-but-terrible machines. 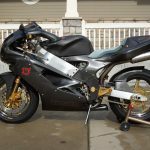 It has 417 kilometers on the clock from new, though the 500cc v-twin has zero miles on a rebuild that apparently fixed its original gremlins. Please see video (link below) and if you need more pics or information just let me know. 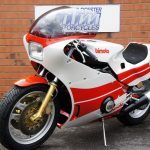 For most reading this you know all about the Bimota V-Due for those that don’t a quick google will tell you all you need to know. 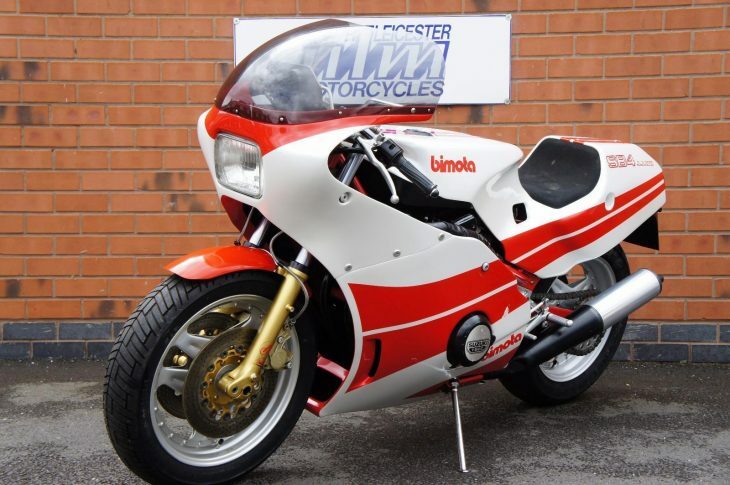 There were less than 500 Bimota V-Due’s built. I’ve had this V-Due for 18 months and bought it from a UK V-Due collector with the intention of preparing it for trackday use. 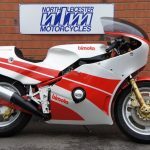 The reality is that its far too good to be used on track hence the reason for selling it. 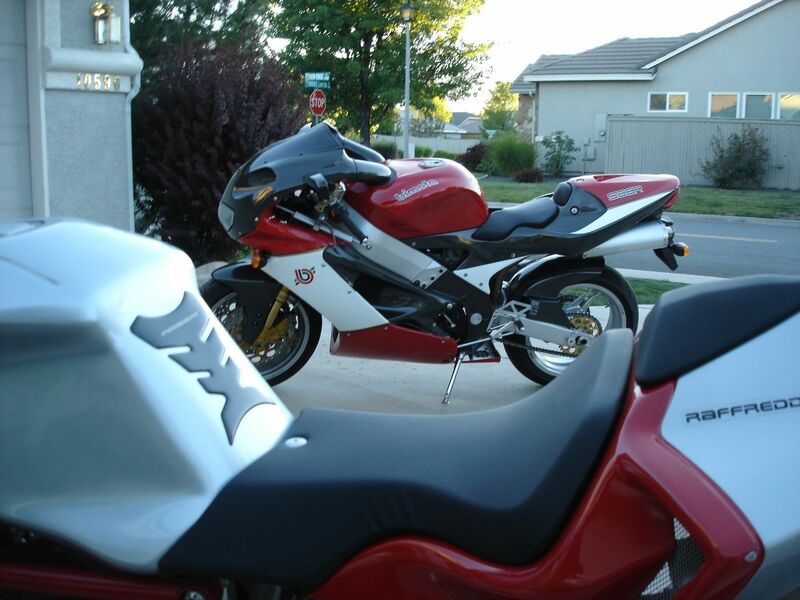 What makes this bike rare, and the one to have, is that not only does it run, and run well but its one of what is believed to be less that 100 injection V-Due’s left in the world. 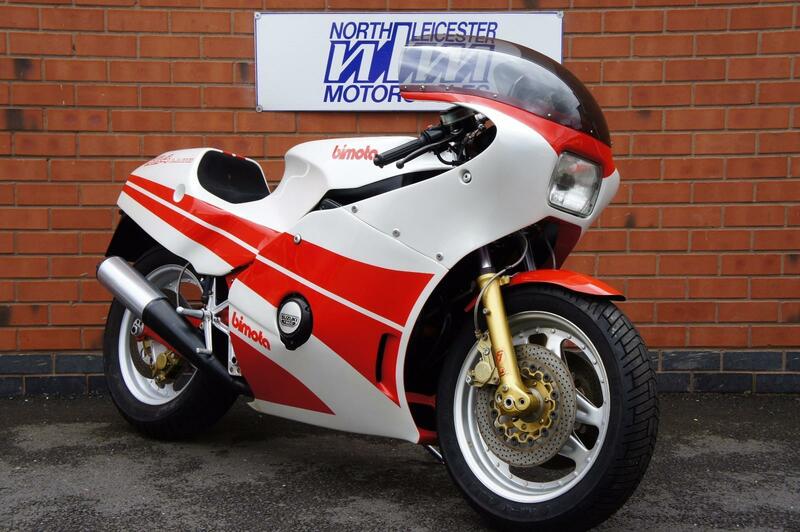 On another point most of the V-Due’s seem to end up in private collections and never used and I’m hoping that this bike will find an owner wanting to take it on and develop it further. Obviously it’s not my concern once it’s sold. 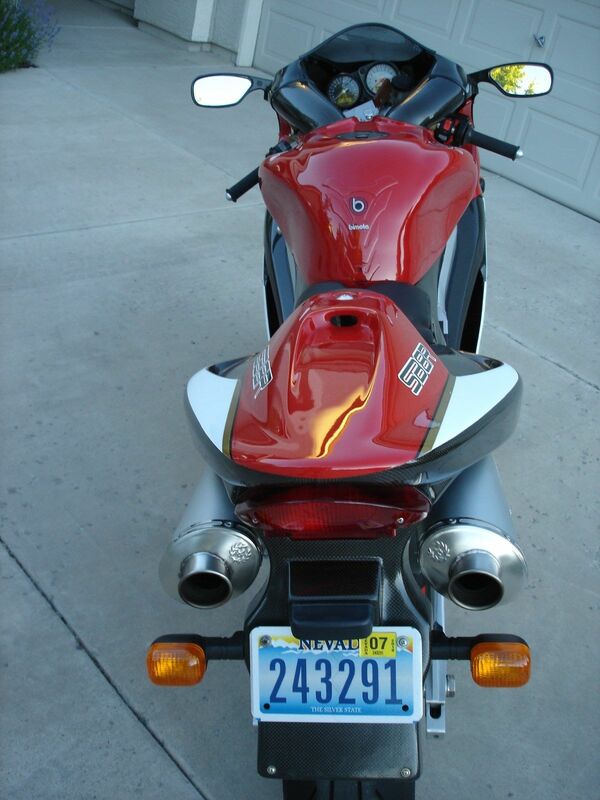 When I bought the bike I knew it had electrical problems preventing the bike running for more than a few seconds. 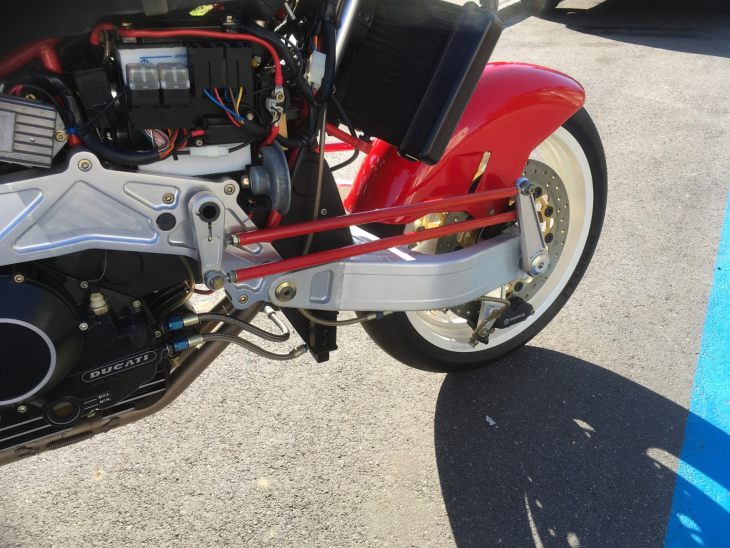 I’ve spent the past year diagnosing the problems and a combination of improving earth connections and other wiring, changing HT leads and fuel line connectors have solved the problem and the bike runs well and now just needs run in. 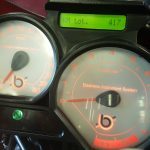 The engine has Zero miles….. 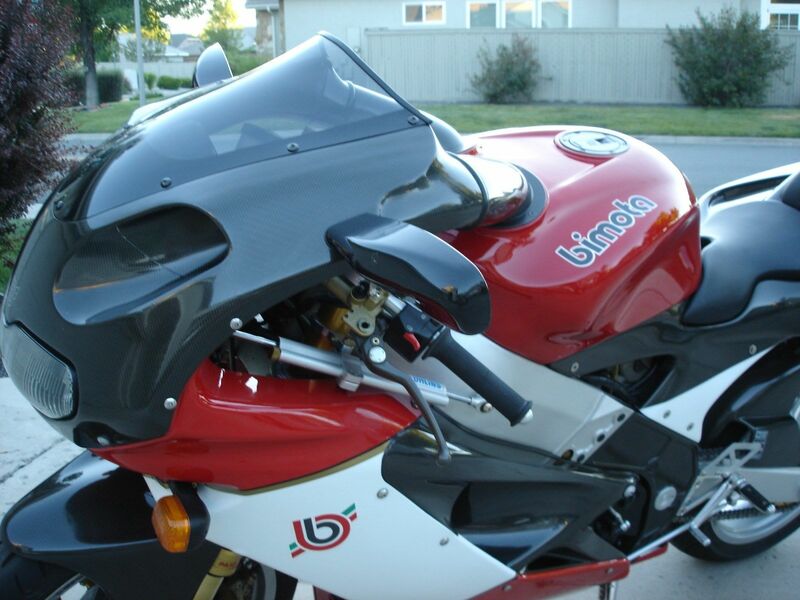 This V-due would have a been an unsold stock bike when the Bimota business failed in 2001. 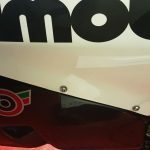 Piero Caronni the then technical director for the V-Due at Bimota bought all the V Due stock when the Bimota factory closed. 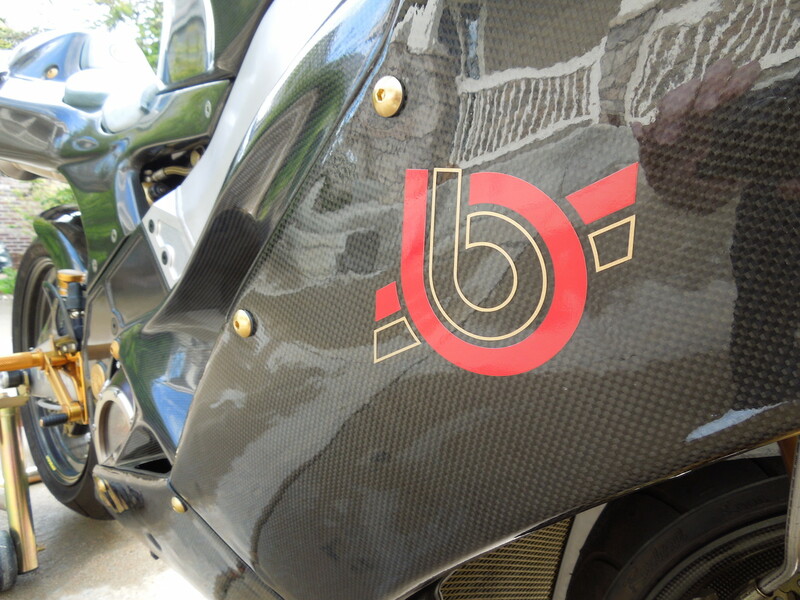 It was then first “sold” by him to Mr Sascha in 2005 in Germany. The German owner then sold it to the previous UK owner before me in 2016. 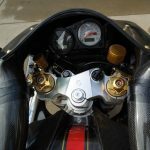 In 2014 the previous owner sent the engine back to Piero to have it rebuilt. 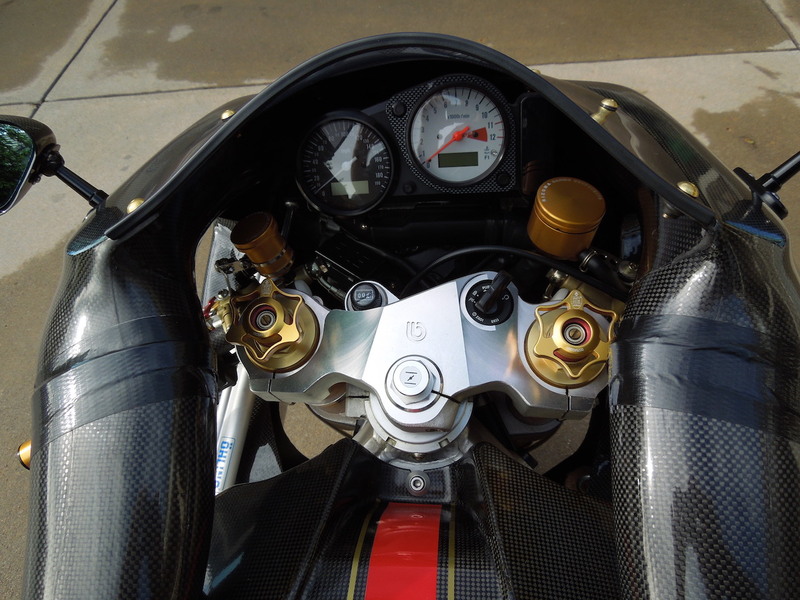 All the mechanical issues relating to the original engine was sorted and left perfect, Piero’s words, not mine. 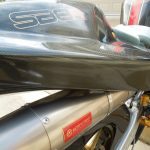 The previous owner then purchased new twin ECU’s, again a problem area in the original bike, bought new coils, and rather than refurbishing the original fuel injectors bought new improved ones from Piero. The bike has a total of 417kms from new, with zero miles on the engine and it is in original condition and specification other than the rear indicators having been changed to something less obtrusive. 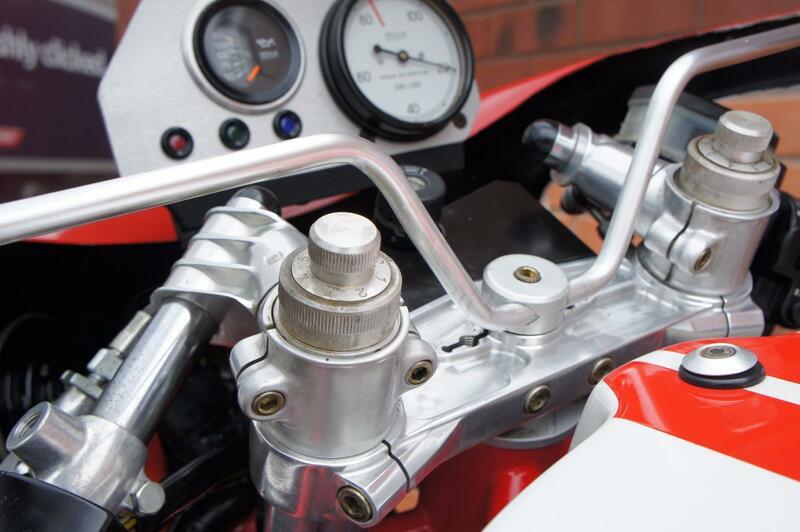 Original indicators are still available new from Classic Bimota Parts in Italy. Also included in the sale are the original coils, HT leads, and twin ECU’s. I’ve also got the original owners handbook - with wiring diagram intact. The German transport documentation (from Mr Sascha) to allow a new V5 to be applied for in the UK. 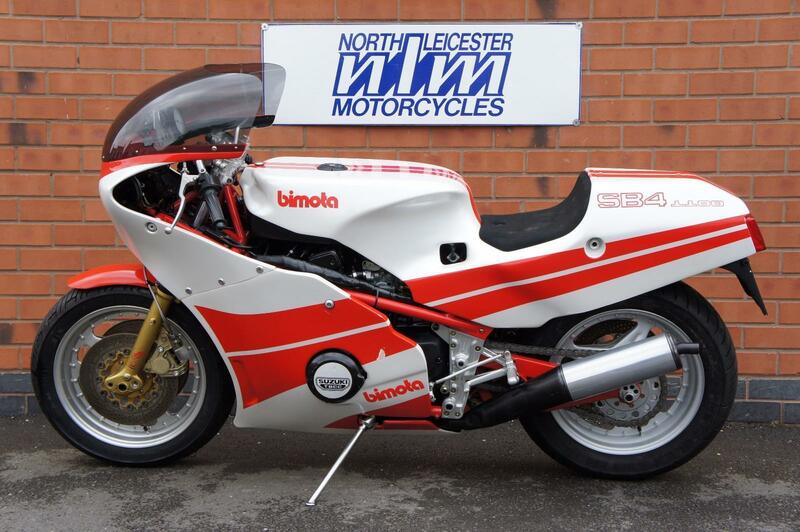 Also comes with a rare Bimota V-Due brochure and magazine pull out. Bike also has both keys. The next owner may want to consider what to do next? 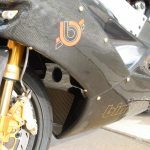 Thankfully there is a keen and growing following of developers and riders and just recently released from promap-europe.com is a new improved “piggy back” ECU along with revised injectors that further improves ride-ability. 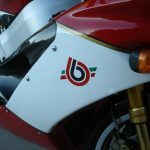 Check out their Facebook page https://www.facebook.com/BIMOTA500/?ref=br_rs this is the way to go if you want to ride this bike regularly. There is a small pin head chip to at the front of the tank that could be dabbed in, personally i’d leave it. 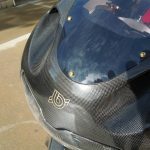 The right hand side of the fairing mid section has had a repair to a stress crack (known issue) that could be improved on at some stage. 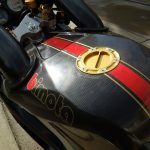 Other than that and a very few light scratches associated with being 20 years old the overall condition can only be described as “as new” certainly the bike with a little detailing could be presented as concours. 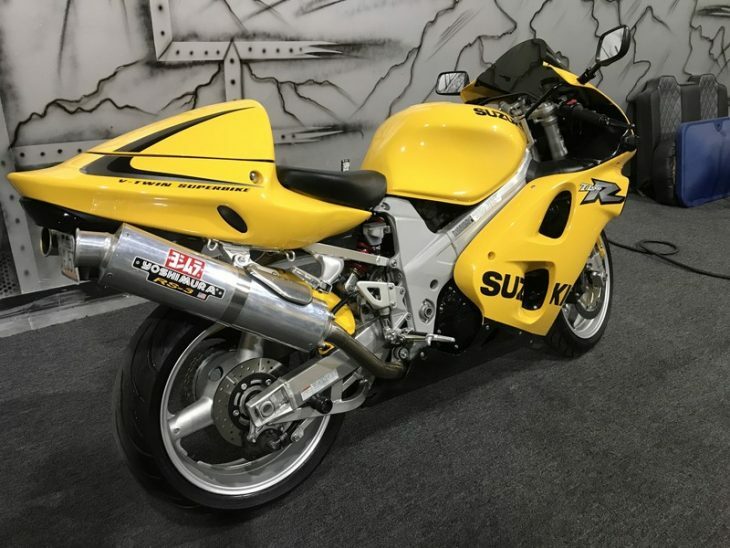 In summary this is a serious collectors bike that can be used and enjoyed, one of the last remaining fuel injected bikes, an appreciating asset. Only a change in my needs for a trackway bike mean this bike is for sale. The bike is located in Lisburn just outside Belfast, Northern Ireland, just 10-20mins from all airports or ferry terminals. I can arrange transport to anywhere in the UK at cost if required. Viewing recommended. 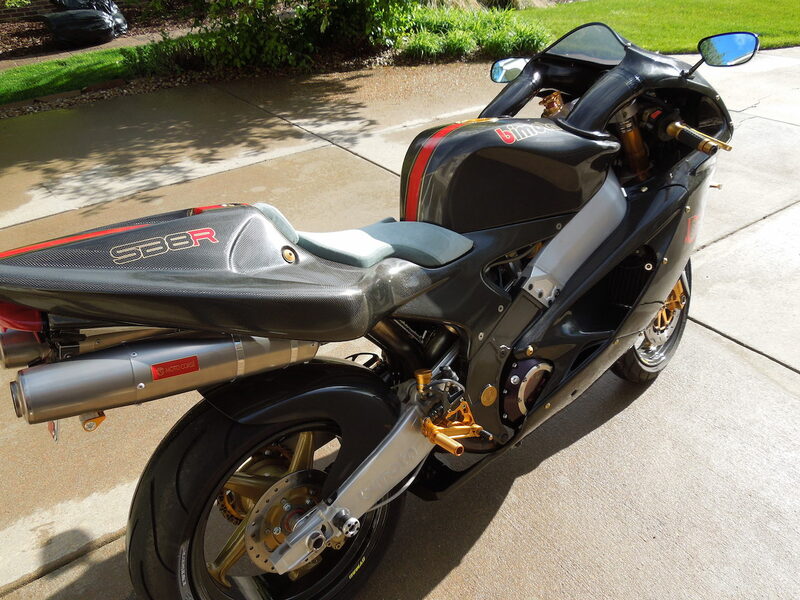 While I have make an offer really the price is what I'm prepared to sell for, if you want to offer me your RC30 and a bucket of cash, well yes then i'd have to rethink. If you have something special then let me know. 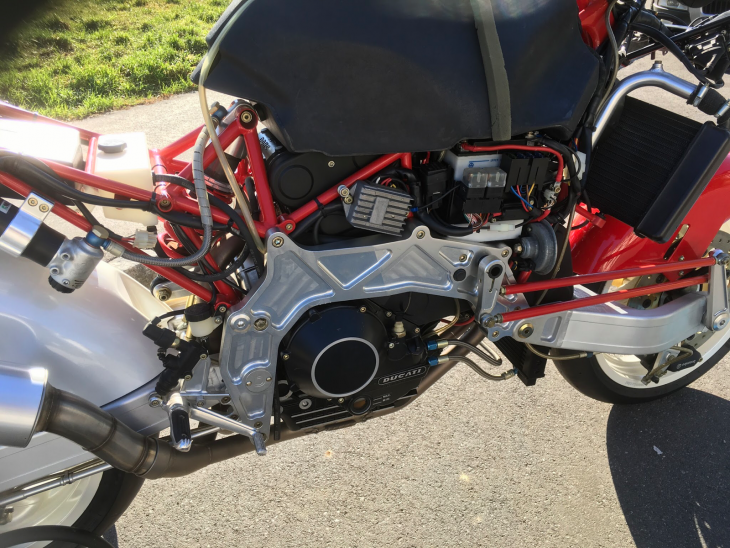 Armed with new ECUs, wiring and fuel injectors, the bike should (emphasis on should) be ready to enjoy. For those in the EU or Britain, registration should be a relative breeze. 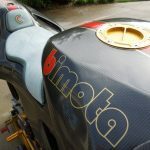 The story will be different on this side of the pond, though that will change once the bike meets the 25-year mark. Even as a track or display-only machine, the Bimota V-Due is odd and interesting enough to warrant serious collector consideration. 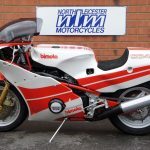 Hailing from a time when Bimota had its pick of mass-produced engines to stick into lovely bespoke frames, this 1983 Bimota SB4S is a one-of-34 machine from a factory that wasn't exactly known for its production capacity. 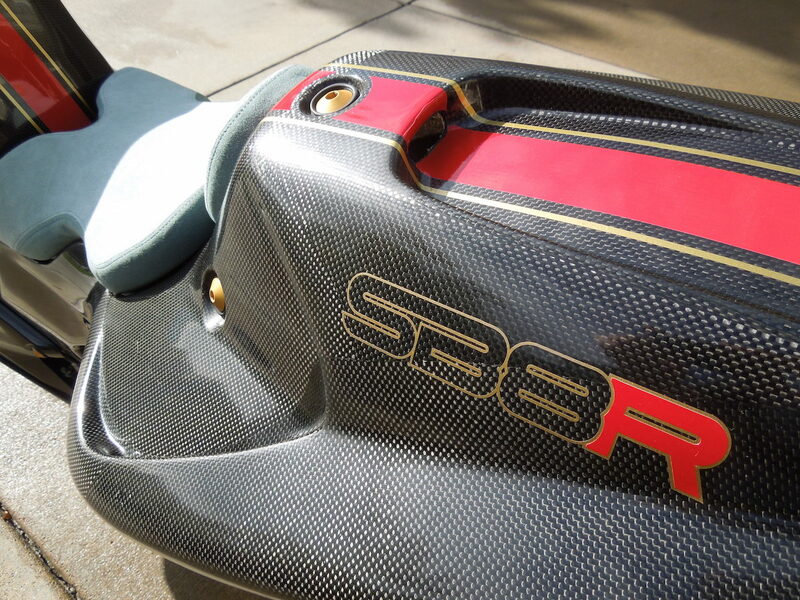 What makes this SB4 so rare is that it is fully faired, setting it apart from the other 200-odd SB4s built. 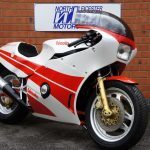 Under the gorgeous red-and-white bodywork lies a Suzuki Katana 1,100 engine, which was about the baddest mill money could buy at the time, and brings the weight savings and simplicity of air cooling to the party. 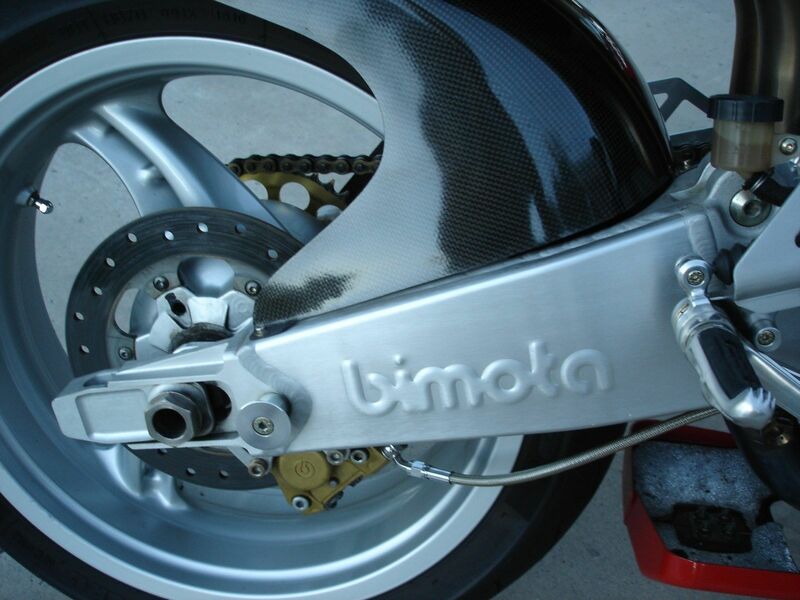 As mentioned, the bike sports a hand-welded frame of Bimota's own design and crafting, and the best suspension money could buy at the time. 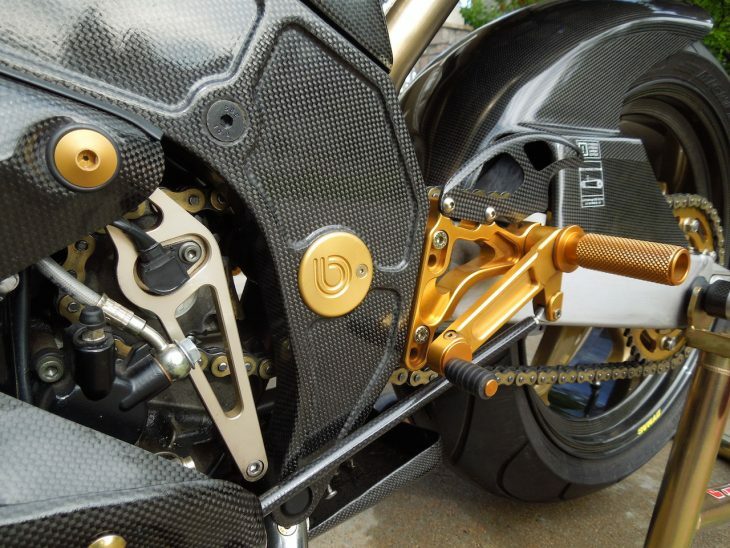 Making this bike even more special is the fact that it is a zero-mile machine. It was purchased and stuck in a collection, making it a truly unused and untested time capsule. 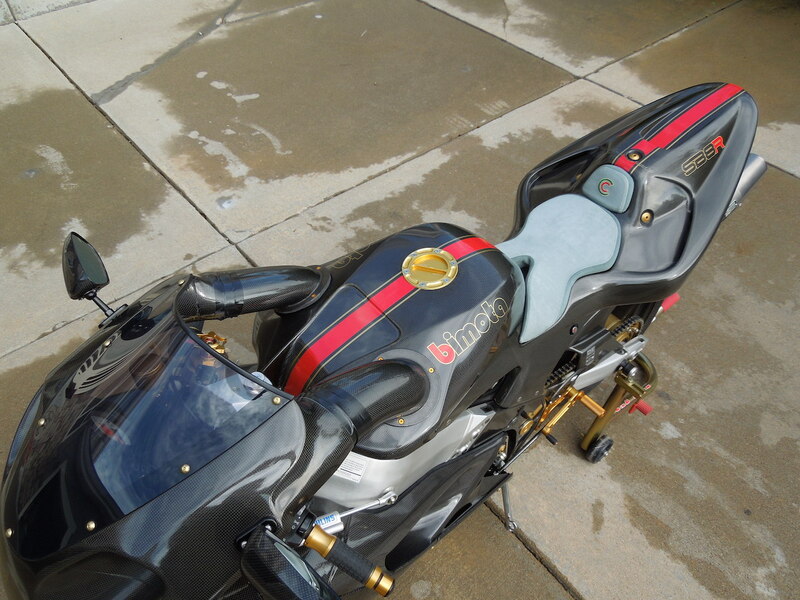 The machine is available through eBay classifieds in the U.K. for £15,885, or about $20,000. 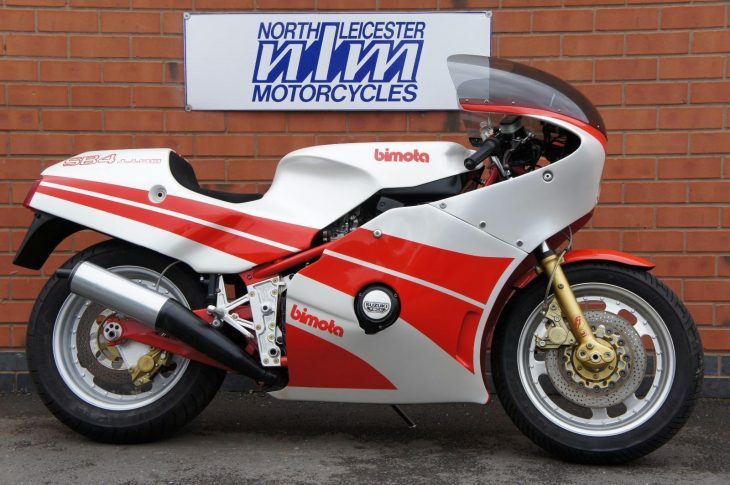 Featured Listing: Beyond Sorted 2000-mile 2000 Bimota SB8R! 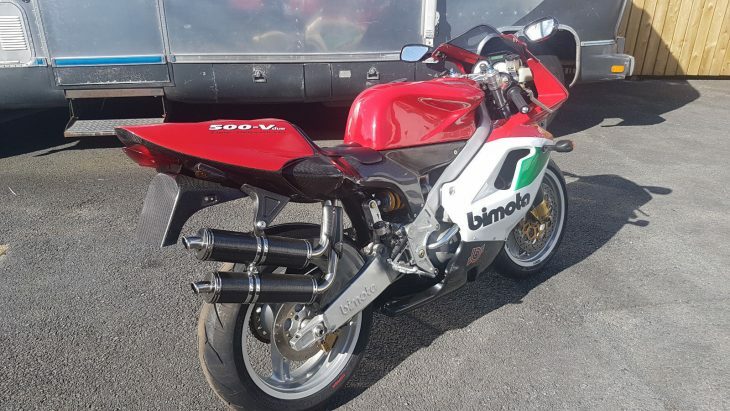 The Bimota SB8R is a special machine on a regular day, but this featured listing takes the rarity and prestige up a couple notches, as it is bedecked with a list of mega-expensive, unobtanium parts that would make a World Superbike team blush. 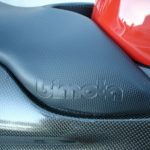 The most obvious is the unpainted, full-carbon bodywork, which encapsulates Bimota's hand-built frame and the powerplant from a Suzuki TL-1000R. 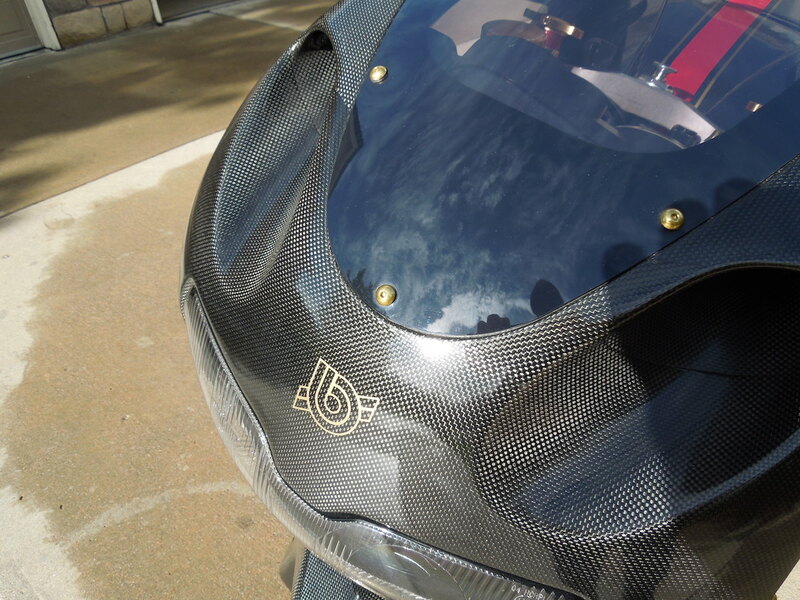 The tank is also a full-carbon fiber piece from an SB8K. We'll just let the seller list the rest of the $45,000 upgrade package in just a minute. Its length and breadth are truly astounding. 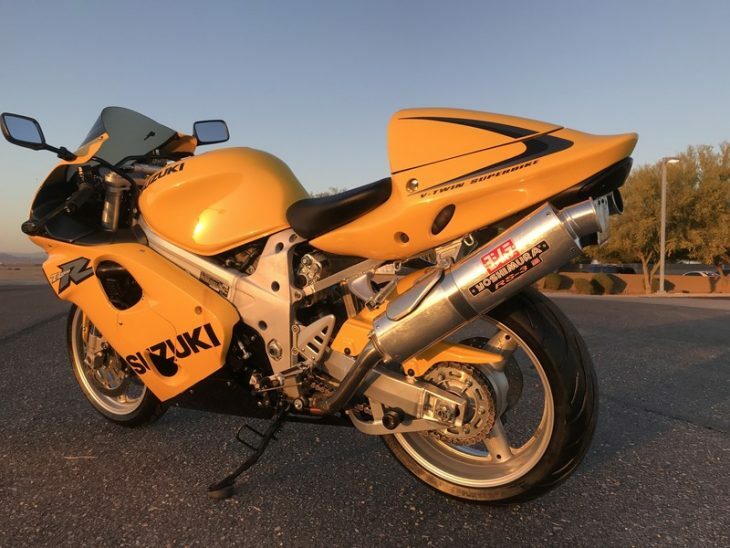 On top of the choice list of farkles, the bike has covered just 2,000 miles in the last 17 years, and has been with its original owner the whole time. 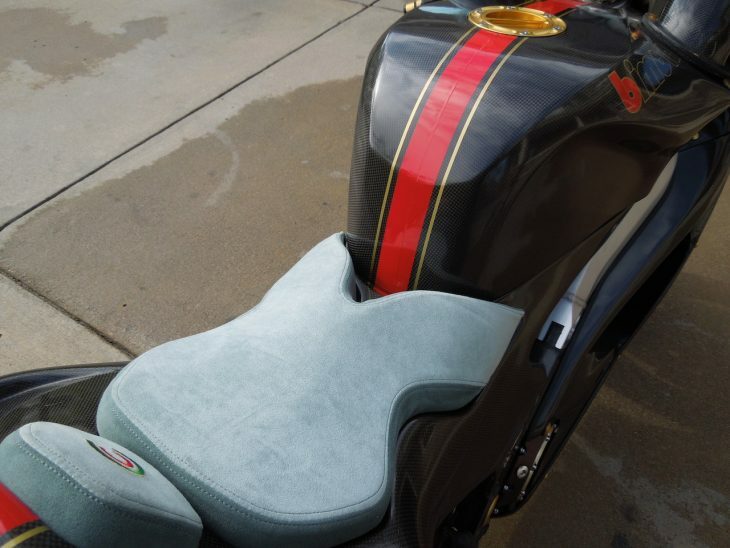 It was purchased new at Bob Smith/MotoPoint in Pennsylvania. The only possible knock on this machine is that the current owner sold off all its factory pieces to fund the modifications. Be that as it may, you can find a factory original SB8R if you look, and you likely will never see another like this one. 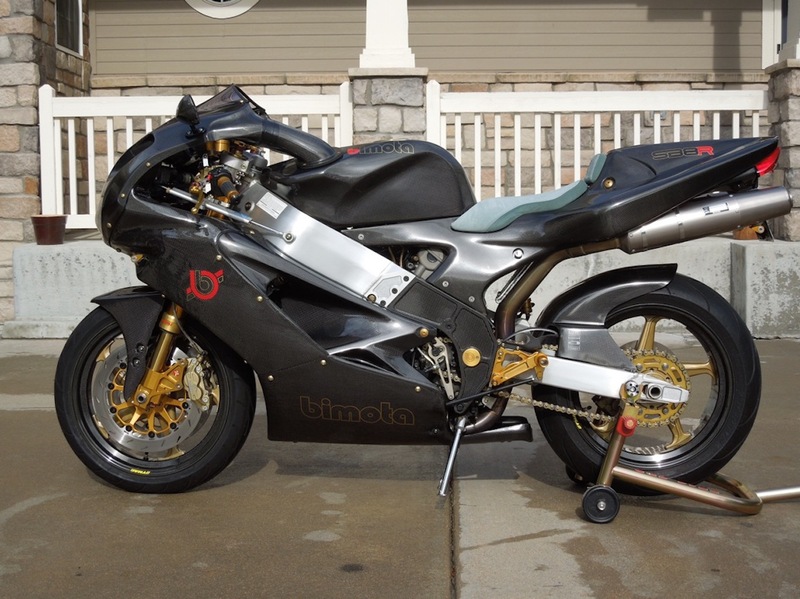 Needless to say, copying this bike for the $21,000 asking price would be impossible, even if you could find the right pieces and parts. The bike is located in Colorado.